Oh my goodness, Megan! You certainly hit the book trailer and book cover jackpot. Megan Jean Sovern: I really did! Which is odd because jackpots and me don’t have a great track record. But you can’t get any luckier than a Chronicle Books cover. The designer, Amelia Mack, had such a strong and delightful vision from the very beginning and it was magical watching it come together. She was even kind enough to let me contribute a few things for the cover. The Student of the Month button is mine from the fifth grade. Well, it’s one of many. And filming the book trailer was a dream. I’ve worked as an advertising copywriter for eleven years. And it was the kind of shoot you only get once. My husband and I wrote the script, enlisted a top notch production company and director, called in countless favors, flew to L.A and shot it over two perfect days. My college roommate, Cyndi Harvell, wrote, scored and sang the song. It was just the best experience. And there was the most amazing guacamole on set, which is always a good thing. My aunt and brother both have Multiple Sclerosis, so Maggie’s father’s struggle with MS hit close to home. I pretty much became obsessed with learning everything I could about the disease in middle school. I spent week after week reading articles in fifth grade, participated in Walk MS in sixth grade, and read Annette Funecllio’s A Dream is a Wish Your Heart Makes in seventh grade. What do you hope young readers take away from The Meaning of Maggie? Megan Jean Sovern: Oh gosh, I’m sorry MS has such a strong presence in your family. It’s a mysterious disease that twists and turns when you least expect it. My editor and I actually went back and forth a lot on whether or not to reveal that Mr. Mayfield had MS. I really shied away from including it because it’s a disease that carries such a wide range of symptoms and struggles from one patient to the next. And I didn’t want the Mayfield family’s experience to color everyone else’s. My own father’s battle with the illness was a roller coaster that’s up to down ratio changed every six months. And I wanted to stay honest to my intention. Which was to write a story about a family that’s handed an incredible challenge and it doesn’t tear them a part. In fact, it brings them closer together. But ultimately we decided to call it by name. It was the right thing to do. And I want young readers to take away a sense of resilience from The Meaning of Maggie. I want them to know that challenges, no matter how big and scary, really push you to find out what you’re made of. And that’s just everything. Well, that and trying to find the funny even at the least funny times. Like when your mom cuts your bangs too short the night before the first day of school. Is this how you feel when you walk into a library? What do you remember about your middle school library? Megan Jean Sovern: This is exactly how I still feel about walking into a library. I love that the feeling never changes even when everything else does. I’ve traveled a lot with my job and no matter where I am walking into a new library always brings back those old, warm and fuzzy feelings. I spent a lot of time in my middle school library during that enchanting time before the Internet took over the world. When microfiche was still the coolest technology ever. And card catalogues were always perfectly alphabetized. And kids passed notes instead of texts. I would love to go back. But time travel style to the early 90’s version I remember. I would get a perm for it and everything. I found myself craving Maggie’s favorite snacks, especially Werther’s Originals, ice cream, Chips Ahoy, and Nutella. I’m guessing you also enjoyed these snacks in 1988. What are some of your favorite snacks today? Megan Jean Sovern: You wouldn’t believe the number of really intelligent and in depth conversations my editor and I had about Maggie’s snacks. On one hand, I didn’t want to portray her sweet tooth as a weakness. She just likes snacks. And it’s totally cool. But on the other hand, her access to them was meant to show one more point of transition. Her mother is no longer around to police the pantry. And her dad doesn’t know he’s supposed to police the pantry. And Maggie’s certainly not going to tell him. Especially when an entire sleeve of Oreos is on the line. Sadly, my snacks today are confined to grown-up stuff like fruit and nuts and green hippie juice. But I think about Mike and Ikes A LOT. (By the way, 1988 is one of my favorite years. 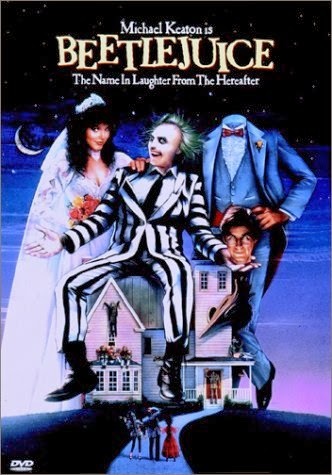 When someone mentions 1988, I instantly think of my first-grade teacher, Beetlejuice, and Who Framed Roger Rabbit? Reading is FUNdamental. This was a slogan on a poster in my middle school library and I loved it. Puns get me every time. When I was eleven years old, I was really forty-seven. Mr. Schu, you should have asked me my favorite lyric from The Hokey Pokey. Right now, I really like the “shake it all about” part. But that could change at any moment. The Meaning of Maggie will be released on May 6, 2014. I'm almost done with The Meaning of Maggie. I love it! Looks like a great book! I can't wait for it to come out! Looks like a great book. Can't wait til it comes out! 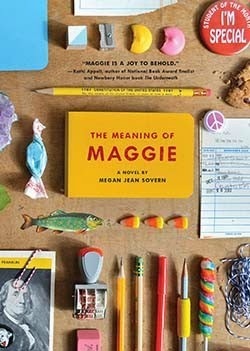 I just finished my ARC of The Meaning of Maggie, and now I cannot seem to get enough information about it or its amazing author! This is one of those books I want to carry around with me and make everyone I know sit down on the nearest couch and read immediately. Geez, so good. Love the trailer and can't wait to read the book! Thanks to Augusta Scattergood for pointing me to this book through its great trailer.